When we are pitching to clients, the one question that always comes up is "What makes you a better creative agency?" We are invariably delighted to answer this question because the answer exists in our history and in everything we do. Sun Graphics Media has been in business since 1924. In the age of graphics design, branding, and UI/UX that seems like an impossibility. However, Sun Graphics Media has its beginnings as a print company. As we grew, we maintained many of our core principles: hire great people, remain a flat organization, make sure everyone feels empowered, respect everyone, and give as much as you take. Our transition to an award-winning design firm came about as a result of deliberate decisions we made as a team. We wanted to nurture our creative side, iterate our brand, and leverage each other to drive success. So, how did we nurture our creativity? Studies show the color green can boost your creativity by up to an astonishing 70%. While many agencies will create work areas with plants, we wanted to take it a step further and make it part of everything we do. We are continually referring to creative briefs, proposal documents, and project plans. These are all branded pieces we produce that contain large amounts of green. Some of our walls, our desks, everything has elements of green. We believe that this simple infusion not only drives our internal branding, but also fuels our creativity. Design challenges are a way of training your brain to generate creativity quickly and at a moments notice, though they can sometimes be quite mentally tasking. Our design challenges typically come in the form of client content. We are always pushing ourselves, whether it is learning to hand-bind books, having ridiculous internal logo creation challenges, or having contests to solve issues like user on-boarding or internal process issues. While some of our teammates are not designers, the only real difference between the design team and the non-designers is merely a lack of the Adobe Suite skills to bring an idea to life. Our entire team consists of problem solvers, and although not all thoughts are complete solutions, they often lay the foundation for the final answer. Our designers are experts at reworking good ideas. 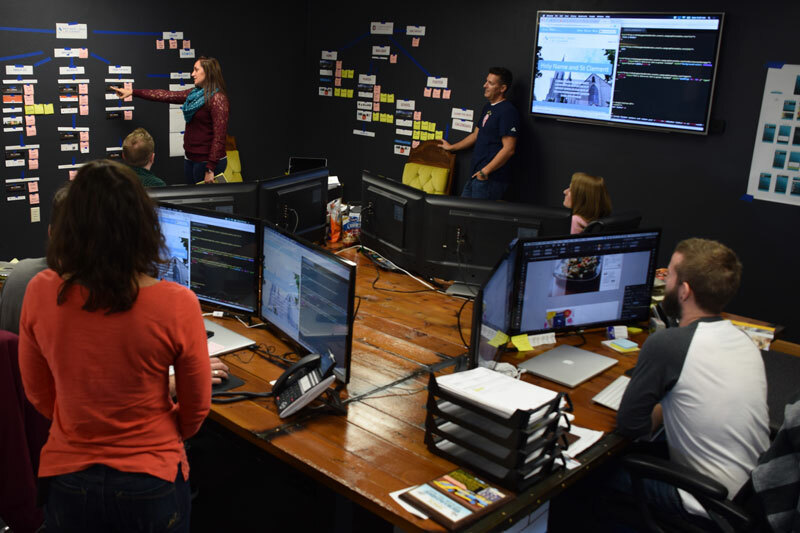 We believe that we are better as a team, and designing is a collaborative process. While we have leads on every project, our clients probably never realize there are multiple teams sitting together, eating together, and socializing together all the time. It leads to exceptional results in everything we produce. We want our teams to occasionally Snap, check Instagram and Pinterest, and talk to each other about their plans and share life events. We encourage the water cooler mentality because we know socializing can help you relax and discover creative solutions at the same time. While there are many reasons for team success, we find that these drive our team, make us happy, and develop a sense of family that no other organization can offer.